Use this guide to deploy and configure precompiled Virto Commerce Platform. You will find VirtoCommerce.Platform.2.x.x.zip file. In this file the site has already been built and can be run without additional compilation. It does not includes all the source code. 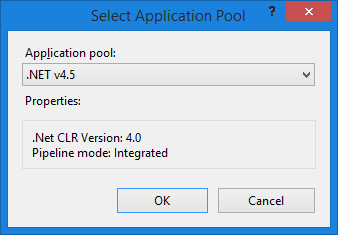 Unpack follow zip to local disk to path C:\vc-platform. In result you should get the folder which contains platform precompiled code. VirtoCommerce: parameters for SQL server database. Provided user should have permission to create new database. SearchConnectionString: type of search engine and its parameters. AssetsConnectionString: type of asset storage and its parameters. 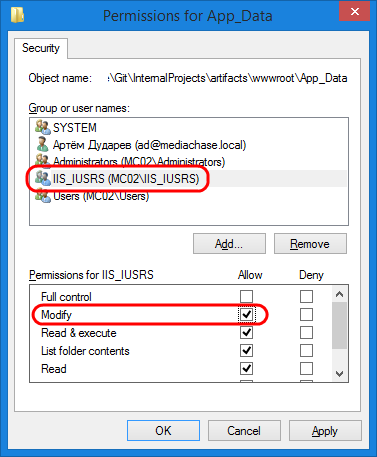 CmsContentConnectionString: type of CMS content storage and its parameters (provider=LocalStorage;rootPath=~/App_Data/cms-content connection string will be used by default)..
Open properties for C:\inetpub\wwwroot\admin\App_Data folder and give permission Modify to IIS_IUSRS user group. 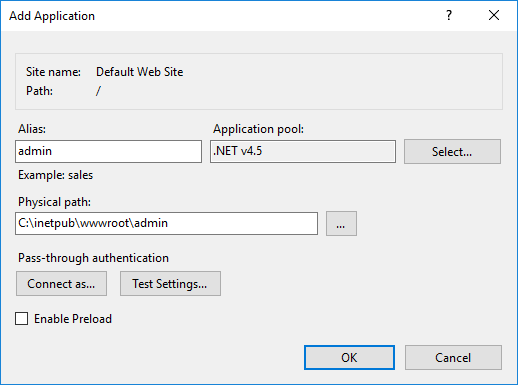 Open the IIS Manager and create a new website or new application named admin inside an existing website. 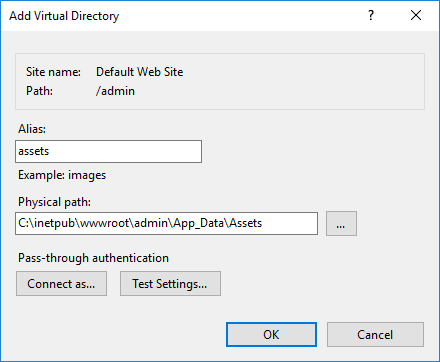 Inside the admin application add the new virtual directory with alias assets and physical path C:\inetpub\wwwroot\admin\App_Data\Assets. If there is no Assets directory inside App_Data, create it. Open the Virto Commerce Platform application in the browser. In the left menu select More → Configuration → Security.